The more I think about art that has captivated me and stayed in my mind, the more I find it difficult to talk about. The problem, so to speak, is that what usually compels me in an artwork is not only its content but its ability to stretch, transpass, bend, or reinvent its own margins, as well as those of my own reality. This, without any doubt, is a great problem to have. In general terms, margins work as borders or edges. They can be the periphery that determines the outer limits of an area or object. They can also be the division between two distinct — often extreme — conditions. This division usually produces something that is “of more importance” and something else that is “of less importance,” which we recognize as “marginal.” Most certainly, all these characteristics can be found, physically or conceptually, in pretty much everything that surrounds us everyday, including art. But how does art play with its own margins and redefine or invent new ones? Where and how can those margins be found? This, obviously, could be the topic of an entire book, but here are a few initial thoughts for now. 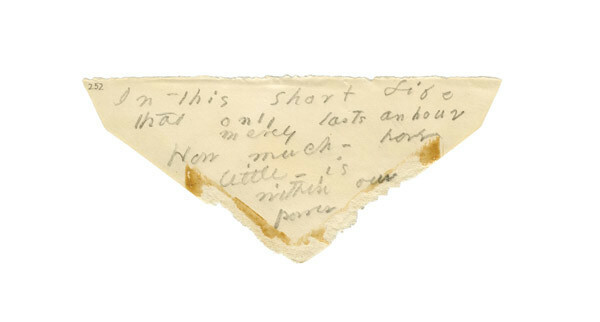 Excerpt from The Gorgeous Nothings: Emily Dickinson’s Envelope Poems (Christine Burgin /New Directions in association with Granary Books, 2013). While the ways artists use media, ideas, space, and time are broadened and enriched every day, the thoughts I have on my own, the conversations I have with colleagues, the way critics judge or evaluate a work of art, and even the way artists themselves talk about their own work tend to always gravitate towards the same direction: to describe what the work is about and why it is — or it is not — relevant to a particular time and context. To do that, I believe, we need to challenge the way we traditionally define the “margin” and the “marginal” in relation to art. Detail. 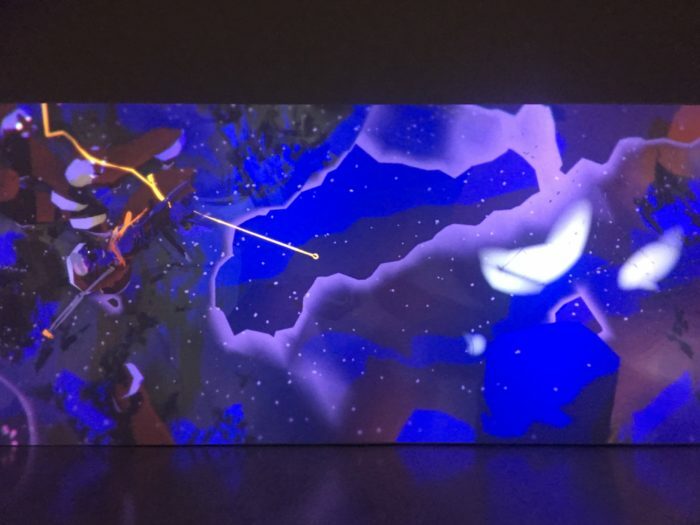 Ian Cheng, Emissaries Fork at Perfection, 2015–16; live simulation and story, infinite duration. Written texts, whether they be short essays or entire books, include a wide range of “marginal” content usually found below, above, behind, next to, or even hidden inside the main text. Footnotes, sidenotes, endnotes, notes on plates/illustrations/graphics/photographs, notes of the author, bibliography, digressive phrases, parenthetical notes, indexes, and glossaries: there’s always room and a reason for them to exist. Visual art is not so different. Excerpt from Marie de France Poetry: New Translations, Backgrounds and Contexts (Norton Critical Editions, 2015). 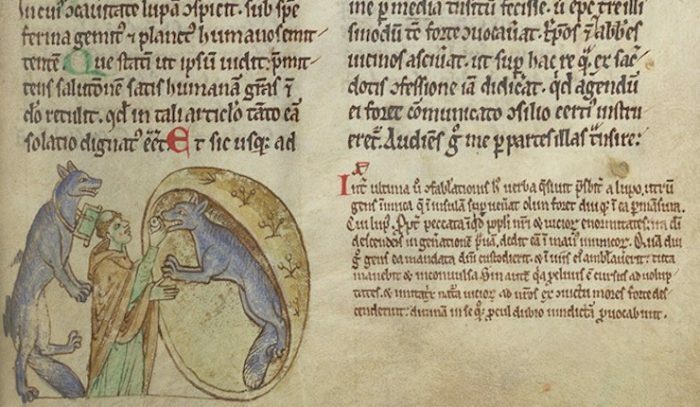 Some artworks also include their own version of marginal content, which is equally valuable. References, citations, definitions, and descriptions of tangential elements are all components that aren’t simply ornaments and stylistic mannerisms in an artwork. Besides providing some useful information that may support what the work is about, these components can also provide a more intimate understanding of the artist’s unique way of seeing and thinking about the world. 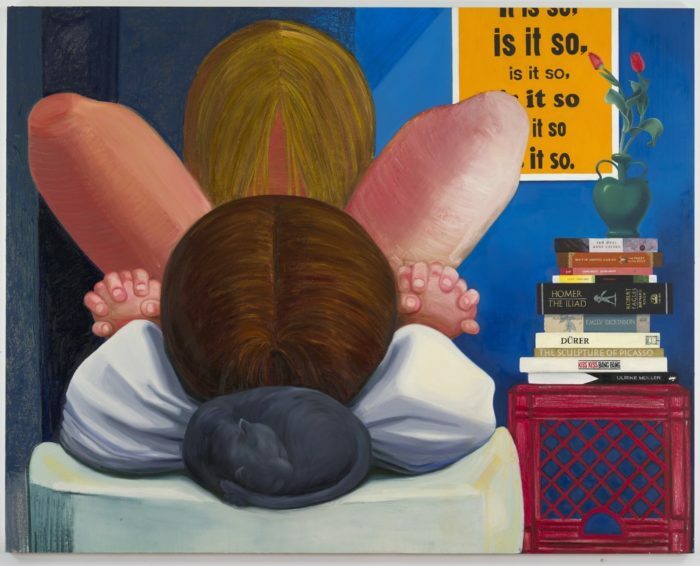 Nicole Eisenman, Is it so, 2014. 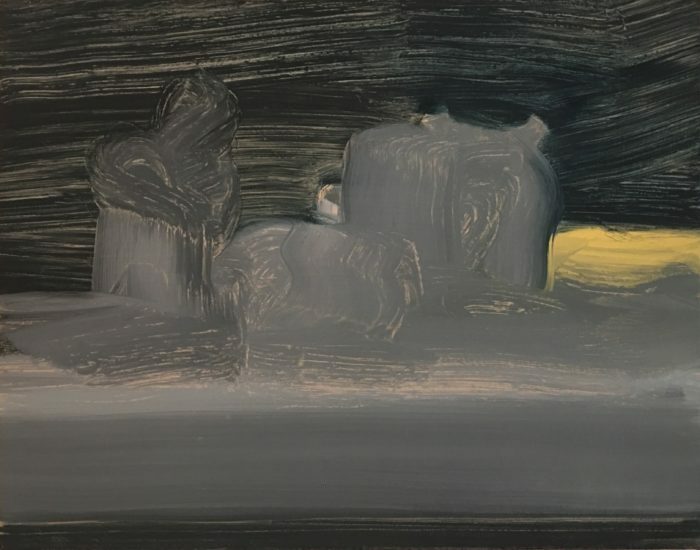 For centuries, painting, for example, has played with the notion of the margins by arranging some elements in the central plane of the composition and placing other less-central elements in its marginal planes. Those secondary elements, very often, have the ability to complicate things a bit by modifying the way we read the work through subtle suggestions and twists. There are also numerous artworks that have embraced the notion of the margin differently. 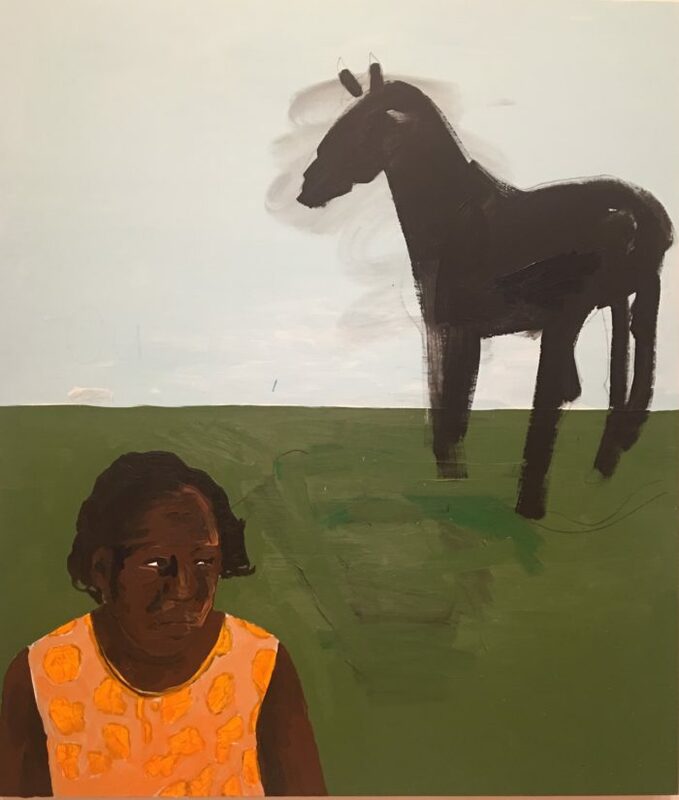 Some artists, instead of using “marginal” content to provide additional information, present their work directly inside or in response to the physical or conceptual margins of a given space or context. Corners, grids, thresholds, outlines, and dead ends can all be the spaces where complex ideas gain force and interminably exist. In addition to understanding and using margins and the marginal in relation to space, art also relies on other abstract and nuanced ways to define its content. An artwork — the type that is not easy to immediately respond to and talk about — is defined by the way its margins and marginal content keep the work’s content fluid and not permanently defined. Instead of exclusively responding to space, these margins function more like qualifiers and modifiers, they provide a unique identity to the work, just like adjectives do to a text. 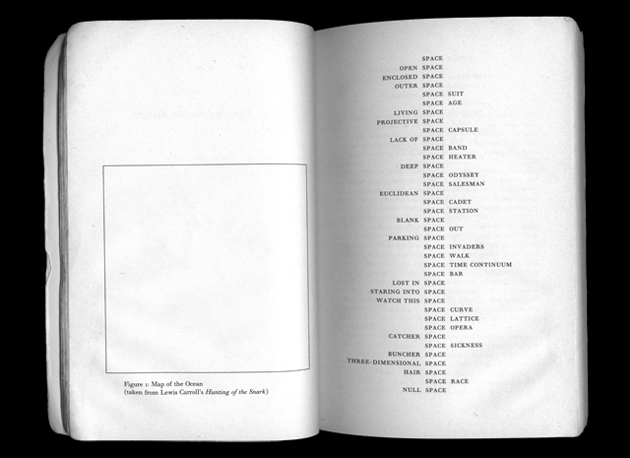 Book spread from George Perec’s Species of Spaces and Other Pieces (1974); Left: Lewis Carroll’s “Map of the Ocean.” Right: George Perec’s “Space” poem. Are the forms above with moving boundaries the same as people with fluid boundaries?